Here’s a really quick and easy Halloween costume idea – especially if you have access to a photobooth in your area. 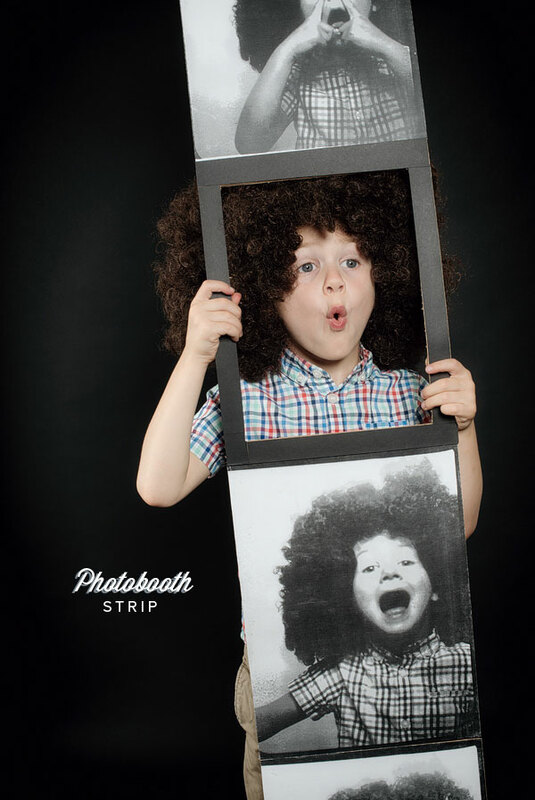 We had Moses put on a wig and take some fun shots in the photobooth. Then we blew up the strip at Kinkos and glued it to big piece of cardboard. We cut out the photo second from the top so that he had the perfect spot to place his face. For Halloween, he just has to wear the same shirt he wore in the booth along with the wig and hold up the strip while he walks. So much fun! too cute! love the afro, such a good idea! Dude, this idea is FANTASTIC! And it’s so perfectly timed, because (just this morning) I was trying to figure out how to top the costume I wore to my office last year. Thanks for the inspiration, Jordan! I think I just found my ticket to winning “Best Costume”, at work, this year. That is the absolutely cutest thing. I’m a little tempted to try it out, but I don’t think I could pull it off as well as he does!! How bout take pictures of the back of his head too, make straps to go over his shoulders so he can wear it like a sandwhich board? HAHAHAHAHAHAAHA I LOVED IT!!! how creative!!! Insanely adorable, clever & timely (and pretty easy)! The perfect combo. This is awesome! Would deff win most creative costume award! Hello, wanted to tell you, I liked this post. That was inspiring. Keep going publishing! AWESOME idea! I might do this w/ my husband. We have two parties to go to the weekend before Halloween. Brilliant! This is brilliant. LOVE it. Might do it w/ my husband for two parties we have Halloween weekend. Cutest thing ever. And you come up with a lot of cute things. One of the cutest and most creative I have ever seen!! !Thanks for sharing! What a brilliant idea. That’s really cool and fun. He seems enjoying it. And I am pretty sure no one else will have the same costume as him. Love this idea. It is great for all ages and extremely original. You may enter as many times as you like – as long as each entry is a different costume. Thanks again for sharing this clever costume – and Happy Halloween!